Announcing Aura by Swarovski, described as an "incandescent, fruity, floral creation" and created by Jean-Pierre Bethouart and Olivier Cresp. The fragrance begins sweet, sharp and a bit overwhelming. Rose, lychee and pink pepper conspire to demand all olfactory attention, to the point of making me sneeze. It reminds me of many I have tested in department stores with pink pepper at the helm; it dominates the other notes. At this stage, sillage is adequate and it does get noticed, although I have yet to receive a compliment perhaps due to all that pink pepper. Notoriously, it does not like my skin. As the fragrance, to my relief, dries down, a tiny bit of tuberose emerges along with the base notes of amber and white musk. I would love this stage if I could smell it without the need to press my nose to my wrist. If these voluptous notes were to headline the fragrance I would be sold! The bottle is elegant and stunning, refillable and unique. Set at the top with a Swarovski crystal, I would enjoy displaying it if I fell in love with the juice. Despite my best effort, I did not. Aura by Swarovski, an inaugural fragrance by the company famous for stunning crystal, will be launched April 2012 at Swarovski Boutiques. I will raffle the 1.7 oz. bottle I have on Monday! 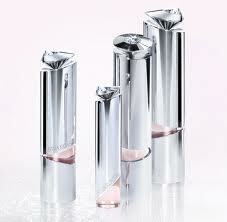 Aura by Swarovski will be available at Swarovski Boutiques in April. The collection includes Eau de Parfum in 1, 1.7 and 2.6 fl. oz bottles for $65, $80 and $100 respectively. Yes. Way too much pink pepper in the top turned me off so strongly I could barely wait for its development. Too bad. I wanted to love it.